After the Kansas Jayhawks football program gained just 21 yards in an entire game against TCU and dropped to 1-7, the grumbling turned to shouting. Fire the whole coaching staff! We need to rebuild this program! The football program is broken. On that we can all agree. But to fire David Beaty and the entire staff does absolutely NOTHING to change that. In fact, it makes it worse. Change takes time. Changing something bad into good, especially something as broken as Kansas football, takes longer than three years. Well, you say, Mark Mangino had KU in a bowl game in his second year! Yes, and Mangino also got KU in the Orange Bowl. AND Mangino violating NCAA rules throughout his KU career also got sanctions, and him fired, and the Hawks in the mess we have been in since then. Mangino broke KU. Because Mangino didn't prepare the program for long-term success. Mangino built fast without caring for the rules. The consequences are still being felt RIGHT NOW. KU tried to hold on to some of that Mangino success by hiring Turner Gill. What Gill did at Buffalo- getting them to a winning record in his second year and a bowl game in his third- KU officials hoped to replicate. You know what happened there. KU immediately- IMMEDIATELY- dropped to 3-9, and then 2-10, and then Gill was fired, with KU boosters basically passing the plate to pay off his contract. What happened next? Do you need me to remind you what happened next? Fine. Charlie Weis happened next. Clearly the same thought process was in play- winning quickly. Charlie was a popular pick because people knew who he was. The hope was that recruits would flock to him. They didn't. Charlie was reduced to begging fans to come to games. He was fired that weekend, four games into his third year. Let me tell you who KU needs to emulate, and who I think they are trying to emulate, and this is going to sting: Kansas State. The Wildcats are one of the worst football programs in FBS history. (Your other candidates are Indiana, Northwestern, Wake Forest, Iowa State and Rutgers.) While KU is only ahead of K-State in the loss column by about 15, the Wildcats would have to win 10 games a year for an entire decade- and KU would have to not win a single game that same decade- for K-State to catch KU in the win column. KU was still above .500 as a program until Charlie Weis, while I feel it is safe to say K-State will never be over .500 as a program. But 200 of K-State's 500+ wins have come in the last 30 years and under one coach- Bill Snyder. 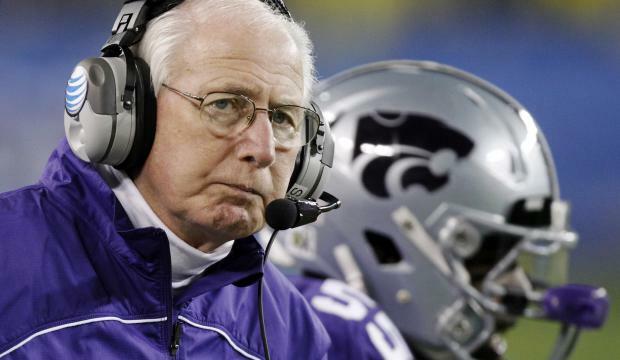 The Bill Snyder model is the one KU simply has to follow. One coach, for a long time. For a loooonnng time. Like until they don't coach anymore. Remember when Bill Snyder retired and they hired Ron Prince? He lasted three years and the exit was tumultuous (not Mark Mangino tumultuous, but pretty good for K-State). This is the model KU HAS to follow. So what did K-State do? They begged Bill Snyder to come out of retirement. That's because they know- and you know, and I know- when Snyder retires for good, K-State is done. DONE. They have NOBODY to follow Bill Snyder. It is not a destination program for any coach except Bill Snyder. And David Beaty is KU's Bill Snyder. 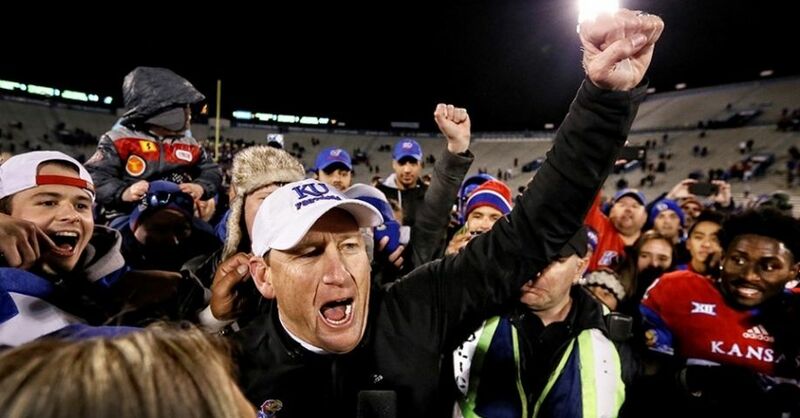 Beaty believes KU can compete, and win bowl games, and challenge for conference championships. KU already had that guy 25 years ago. His name was Glen Mason. HE got KU to a bowl game in his 5th year. (And then he left, because Glen Mason had more aspirations than being at Kansas. It's not for everybody.) That's about right. Nobody is going to quick-build KU football in three years. KU football is broken. If your car was totaled, would you rebuild it or get another car? Beaty has no choice. He HAS to rebuild his totaled car. It's not going to be done this season. "Rebuilding" is not what this program needs. It needs to be changed completely. It needs to be done piece by piece. 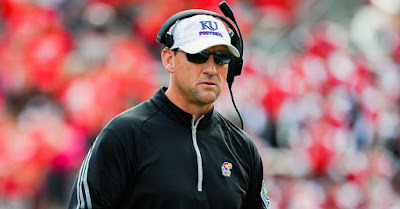 Firing Beaty now sets KU back ANOTHER ten years. Anybody who doesn't see that is crazy. If Beaty gets fired, K-State might really pass KU's all-time win total in a decade.